Battle the post-turkey haze with our pick of the best Black Friday deals. Thanksgiving's over, you've digested all your turkey and now you know what time it is: it's Black Friday and there's a whole universe of bargains out there waiting for you to grab them. We know this because while you've been sleeping off all that pumpkin pie, we've been scouring the internet for the best Black Friday and Cyber Monday deals known to man. Fact is that there are almost too many deals out there, of unprecedented levels of hotness, and they may be simply too much for your mortal mind to take in all at once. So that's why we've gone to the trouble of picking out 10 of our absolute favourite Black Friday and Cyber Monday deals that are available for you to buy right now, and listed them below so you can snap them up in seconds and then return to the important business of finishing off that leftover turkey. Happy shopping! Save $100: If you're after the best laptop money can buy then this Huawei MateBook X Pro is a serious contender, and with the promo code MBLB111918Q, you can get $100 off. Save $100: The Xbox One X is Microsoft's latest and greatest console. Although the PS4 trumps it in console exclusives, the Xbox One X has greater backwards compatibility, 4K and QHD screen support. 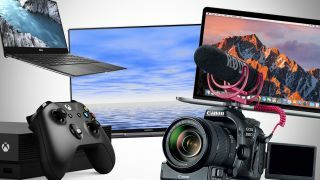 Save $400: This Canon 80D deal not only bundles the DSLR with a great lens, but also adds a microphone, 32GB SD card and Canon's electronic focus and zoom pulling accessory – giving you $400 in savings overall. Save $13/month: The scope of this package is stunning: Photoshop and Illustrator are there, naturally, but you also get another 20+ applications for desktop and mobile - including inDesign, XD, After Effects and Dreamweaver – plus 100GB of cloud storage. Save $200: This 32-inch, 1080p monitor is selling fast, so hurry if you want a fantastic $200 off from Dell's website. With a 1,200:1 contrast ratio and 8ms response time, it's perfect for general use. Save $650: It's rare to see such a big discount on Apple gear, so set your sights on this 2017 MacBook Pro, which is a massive $650 off list price. Save $330: Amazingly, Microsoft has the best deal on a Surface Pro 6, with $330 savings. It includes the 2-in-1 tablet with the Type Cover keyboard included. Save: $100: This drawing tablet for Mac and PC is Wacom's finest so far, and with 8192 levels of pressure sensitivity it takes things to a whole new level. This Walmart deal knocks off $100 – when they sell out, you can get the same deal at Amazon. Save $80: Walmart has a pretty sweet deal on this 2018 Wi-Fi-only iPad; it comes with 32GB storage, Touch ID and runs iOS 11. Silver's sold out already, but gold and space grey options are still available. Save $250: Bag the newest version of Dell's leading laptop, with an 8th-gen Intel Core i7 processor, 8GB of RAM and a 256GB SSD, from Office Depot with an excellent discount.